Barnie's Office Coffee - Barnie's Blend Decaf. 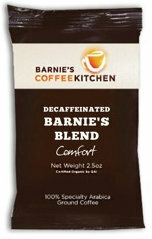 Barnie's blend decaf office coffee is a blend of South and Central American coffee. A well rounded coffee that is sweet, balanced and full bodied. Each case contains 24 bags with 2.5 oz coffee.